"Ah yes. Where's my pipe and slippers?" 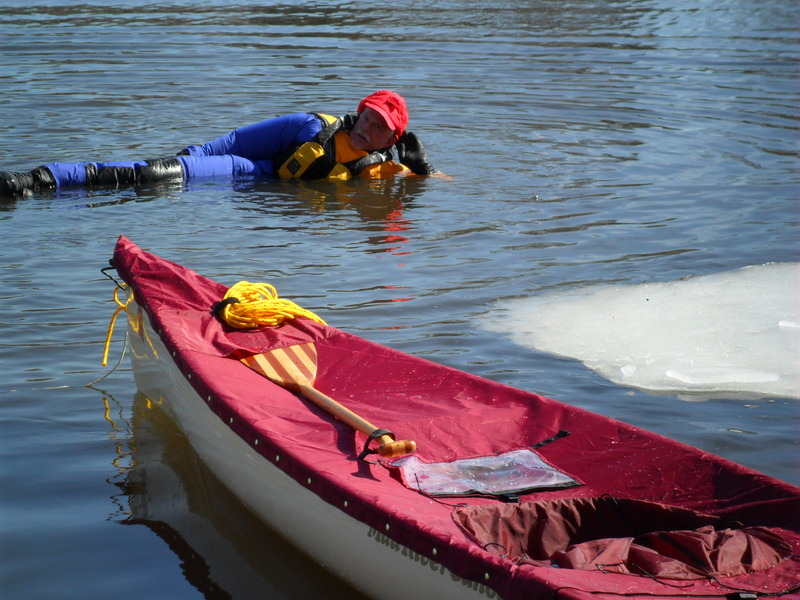 This entry was posted in Equipment, Music and Video, Paddling, Safety and Technique and tagged Astral pfd, Cooke Sustom sewing, Harmony solo portage yoke, Kokatat, Mad River malecite, Otb boots, Stanfield wool union suit, Wisconsin. Bookmark the permalink. Good job Corey and Lois. You look pretty spiffy in that dry suit. You’re so brave to get out in that cold water and float around. Good to know that you can get back in your canoe. WHeeeeu ! Terry, thanks for noticing. It’s a bit different look than my Dickie/Carhart knockoff pants, my ratty old wool sweater, and rubber boots from Fleet Farm (Fart and Flee). They have been my cold water protection – or non-protection – on every other trip to date. Thanks for documenting your cold plunge tests! There’s something mighty suspicious about how fast you get back in the canoe (at about 4.5 minutes into the video). That clip looks similar to one earlier, only in reverse… How do you get back in the canoe, I wonder? Did you have to take the spray skirt off? Go back to shore? I’m more familiar with sea kayaks. HMMM Looked suspicious, did it? Don’t you think I have the core strength to muscle my way back up? A trick of the camera perhaps. -Great fun to watch and hear your voices during your cold water day of adventure. Really fun!! Time is getting closer. Do you expect a crowd for the send off? If you publish the time and place I would sure like to be there. Looks like the Rum to me, but I don’t go up that way too often.